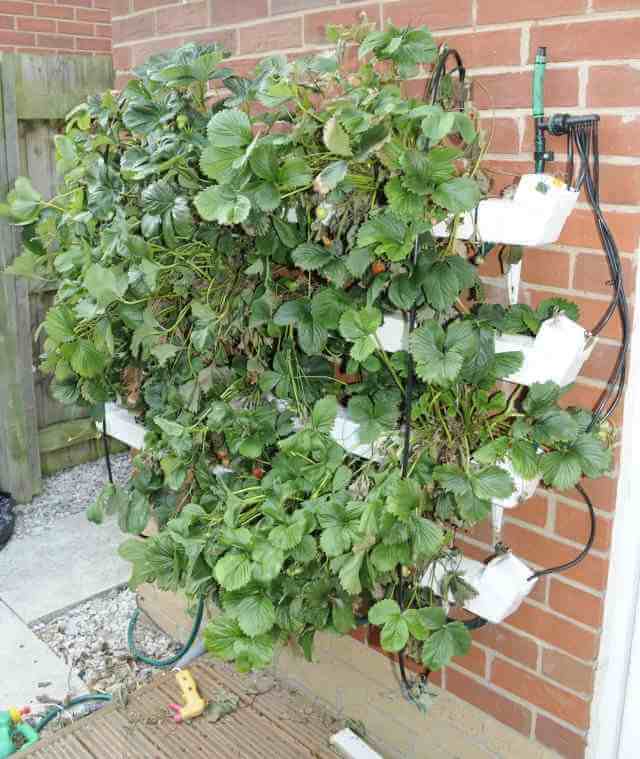 This entry was posted in 2014 Growing Season, Hydroponics and tagged automation, channels, clay pebbles, correx, drain, ebb, flood, greenhouse, nft, nutrients, strawberries, strawberry by Paul_E. Bookmark the permalink. 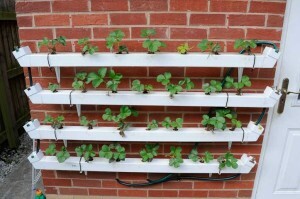 Like your idea for growing strawberries in gutter downpipes, and thinking of copying for my Aquaponics setup. What size is the downpipe? Did you grow them year round? Was it successful? Hello Lindsay, The downpipe is about 3 inches square. It’s a little too narrow really so a little larger would be better. 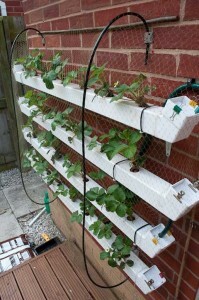 I am growing the strawberries in them all year round but they only really fruit from March to October here. The plants are now in the second year and are fruiting the best this year. 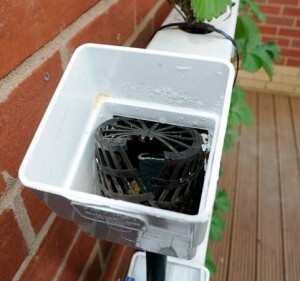 It’s been very successful, Maybe a little too successful though as a Robin thought it was so good it decided to make a nest within the plants a few months ago. After he left I had to remove a couple of the plants as they had made a mess of them. I’m harvesting quite a few strawberries every day now and will post an up to date photo in a minute, But I’ve just removed all red fruits though so it just looks green. 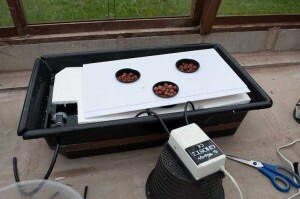 I was planning a very similar system with one difference: No pebbles or clay or any solid material. 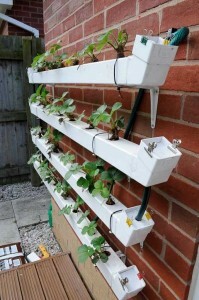 So it will be almost like an Aeroponic system. 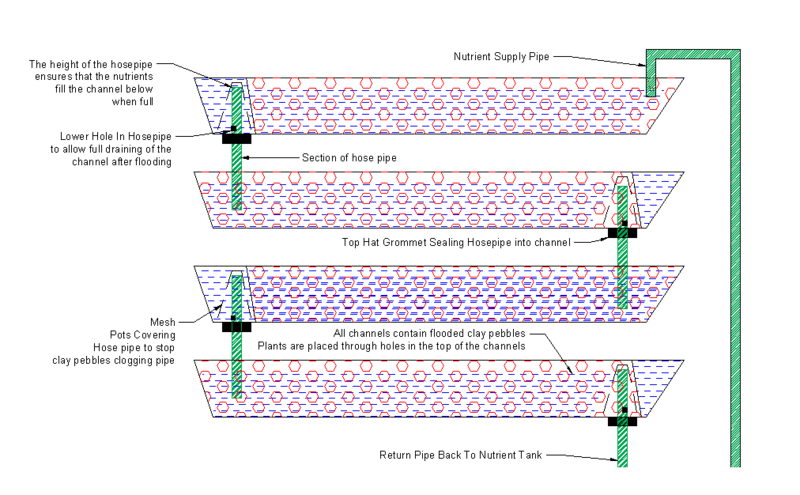 I will be using a larger drain so it will be fast fill and drain system. 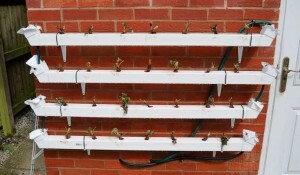 Again, only one pump, working intermittantly to allow the plants to breathe. 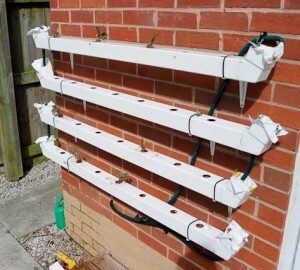 I’m glad you like the system, I’m using General Hydroponics Flora Series 3 Part nutrients and I flood about once an hour during daylight in summer, But only a few times a day now. Hope you have a good christmas too.